It sounds like something out of some weird "primitive" religion in an "underdeveloped" country. But it's going on right now, as it does at this time every year, in New York City, Los Angeles, Jerusalem and other cities around the world that have orthodox Jewish populations. In the "tradition" known as "kaporos" or "kapparot", on the eve of the Day of Atonement you buy a live chicken from a dealer, tie her up in a particularly cruel way, wave or swing her around your head or someone else's, and then kill her. 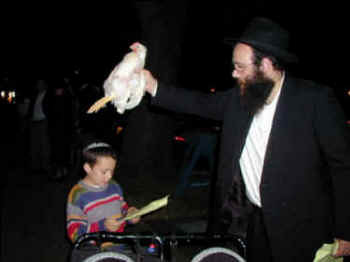 In doing this, you are said to have transferred your sins to the chicken, who then conveniently dies for those sins. It's basically a version of what was practiced in ancient times when a lamb took on the sins of the community and was then killed – or a goat was saddled with the collective sins of the people and then driven out into the desert. But the kaporos continues nonetheless. Many rabbis (but not enough) speak out strongly against this cruelty. Orthodox Rabbi Shmuly Yanklowitz wrote in The Jewish Week that kaporos observers "should be cultivating mercy for all those who suffer and not be perpetuating pain on sentient creatures in the name of piety." And Rabbi David Rosen, a vegetarian who is International Director of Interreligious Affairs for the American Jewish Congress and former Chief Rabbi of Ireland, encourages "those who wish to fulfill this custom [that they] can do so fully by using money." Back in the 13th Century, the revered Rabbi Moses ben Nahman condemned the kaporos as being contrary to fundamental Jewish teachings of kindness and compassion. And numerous Jewish animal protection groups speak out forcefully against this behavior. The Alliance to End Chickens as Kaporos will be holding demonstrations this Sunday and Monday evenings in Brooklyn to protest the activity. They will explain, as they do each year, that the chickens are trucked in from factory farms, kept in crates without food or water for days in advance of the ceremonies, and sold on the streets by merchants who are simply out to make a buck from the deluded people who follow this custom. In past years, crates of barely living, unsold chickens have been found abandoned after the Day of Atonement and taken to local shelters. But religion is a tricky business. Religions guard their laws and customs, and will scream "religious intolerance" whenever these are challenged. One such custom is the "law" that requires the kosher killing of animals for food. Animal protection groups regularly speak out against the widespread practice of kosher killing, in which cows and other animals are turned or hung upside down while still conscious and have their throats slit. The whole cruel, sorry practice is designed to follow a biblical injunction to drain as much of the blood as possible from the body while the animal is still alive. In the Muslim world, the same basic practice is known as "halal" and, because of the numbers involved, is far more extensive than its kosher cousin. So, is kosher/halal killing OK, while the kaporos killing is not? Where do you draw the line? Where does the freedom to practice your religion infringe on the most basic common decency toward nonhuman animals? Laws and ruling like this uphold the "rights" of humans to practice cruelty to animals, while ensuring that the animals themselves have no legal rights whatever. Kaporos is a disgrace. And perhaps the best way any Jew living in New York could honor the High Holy Days this year would be by joining one of the demonstrations against this sickening practice next week. If the Day of Atonement is to mean anything at all as a day of "at-one-ment", then repairing our broken relationship with nonhuman animals and the world of nature should be at its heart. 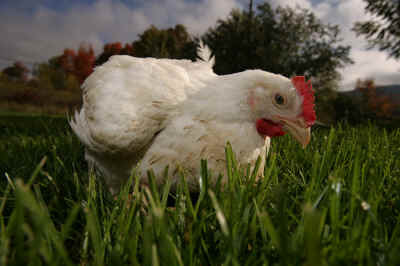 Chemers, a baby rooster, was rescued from Kaporos rituals in 2010. This photograph is one of 12 winning photos published in the 2011 Chicken Run Rescue calendar (www.brittonclouse.com/chickenrunrescue).